A while ago I was reading a collection of articles by Karl Theodor Weigel. The man speaks about folkloristic habbits and symbolism that goes back to the prechristian religion. He gives symbols representing the years, such as I have shown you in my article “Odhinn, God of the year”. Towards the end there is an image of a Christmas-bread from Lauterbach Hessen, Germany (left) “that strongly reminds of the god in the wheel, in the course of the year”. That is the same symbolism as that I gave to Odin with his two arms on the hips. The Christmas bread made me think of the famous statue of Freya with a gigantic necklase, her Brisingamen, around her neck. Freya as Goddess of the year, not such a strange idea, because she is connected to fertility and therefor the cycle of the crops, death and rebirth, the changing seasons and thus the year. So might this be the reason that the Brisingamen has such enormous propertions? Let us see what is said about the Brisingamen. The Brisingamen was fabricated by dwarves, known as the Brisingen. According to the Sörla þáttr, Freya wanted to have it so badly that she slept with each of the dwarves. Odin (whose mistress she is in this story) gets so angry that he has Loki steal the necklase. Loki also steals it in the Húsdrápa and in this case Freya gets it back with the help of Heimdall. But what is the function of this gem? Some sources say that the necklase makes Freya irresistible to men; other sources say that it gives Freya magic powers; I even read that it protects Freya from the total demise of Ragnarök; maybe the Brisingamen refers to the zodiac, or the (course of the) sun, because it is very explicitly made of gold. It seems that the old texts do not give a function for the Brisingamen, but it plays a very notable role in the Thrymskvida, the story of the theft of Thor’s hammer. Thor misses his hammer, Loki (using Freya’s falcon wings) finds out that the giant Thrym has it and he only wants to give it back in trade of Freya herself. When Loki and Thor tell this to her, Freya gets so angry that her necklase bursts. Nonetheless, when Heimdall proposes that Thor himself should go to Thrym disguised as Freya, his is able to wear the necklase. Two elements of this story show that the Brisingamen is an inseparable part of Freya: it bursts when she gets angry and even Thor looks like Freya only when he wears the necklase. Maybe the Brisingamen is Freya, is fertility, is the course of the year and this is why Freya, like the German Christmas bread, is almost entirely surrounded by it (it ends by her neck to give the idea of a necklase). Somehow it seems that all Gods of the Norse tripartite have something to do with the year and with fertility, a triplicity for sure! Well I have often wondered about the Brisingamen necklase. Norse women did wear a lot of jewelry during the age of the vikings and they still do on their bunads (fine clothing, still used today). Since the belief of the Vana Gods was younger in the north than the Åsa belief system, They had to make some stories that could be mixed with the old religion, Åsatro (Odin, Thor, Heimdal etc). Because I am pretty sure the dwarfes in the story belonged to the Åsatro. Freya was a hostage in Åsgard after the first war between them. She was so beautiful that I guess they had to put some romantic/sexual stories around her. But I do wonder… How did the necklase look like? Heilsa! The Brisingamen. like so many things Norse is based on a celestial event. Sometimes at a solar eclipse the moon does not completely cover the sun and there are glowing globular bits around the rim. These are called Bailey’s beads. And you will note that when there are images from the past that most associate with Freyja she is wearing a necklace of beads, rather than a torque. 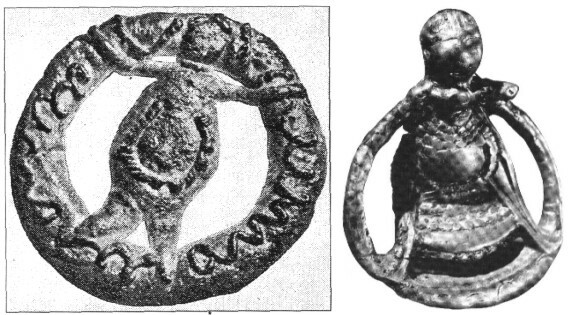 The Seithkona (seithr being associated with Freyja) from Iceland wears a ‘glass’ bead necklace. Anciently glass could also mean amber. According to Grimm in Norway the term ‘brising’ was used for kindled fire. So you can see how the fiery Bailey’s beads came to be associated with the jewel of Freyja. The depiction above: A cycle of mankind( 2 dimensional in appearance),later, a female figure that overlooks that cycle and has her woomb in the center (3-4dimensional in appearnce/symbolism meaning). the cycle connected to her throat/neck. explanation: the duration/dimension of a cycle of mankind(one Aeon/eternity ) equals the breath of the sun. The numbers are actually out there and known. numb er wise that is 2.3 million years. in hte acoording scaleorder that is: an impression for the galaxy , a breath cycle for the sun , a cycle of day and night for the earth and a lifetime duration of mankind (aeon) .